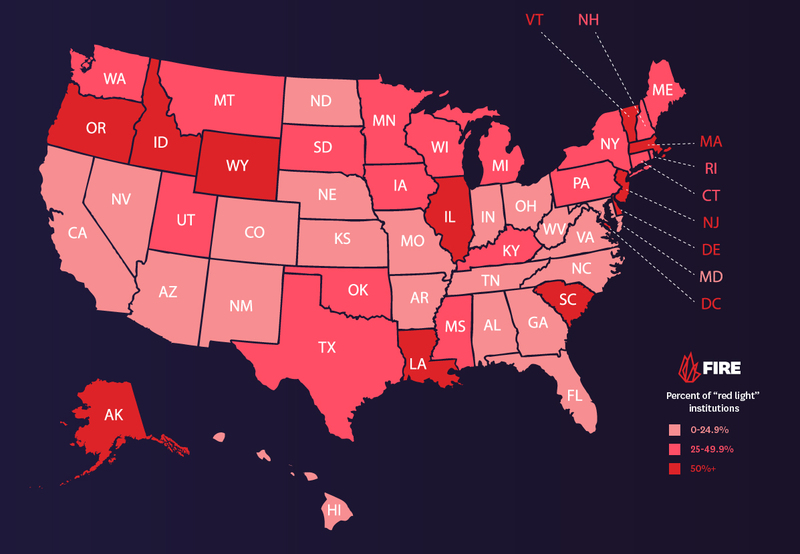 In 11 states, at least half of colleges rated earn FIRE’s worst rating for “clearly and substantially” restricting free speech rights. Almost 800,000 students at top U.S. colleges must find a “free speech zone” to exercise their expressive rights. PHILADELPHIA, Dec. 11, 2018 — The vast majority of students at America’s top colleges and universities surrender their free speech rights the moment they step onto campus, according to a new report from the Foundation for Individual Rights in Education. Released today, Spotlight on Speech Codes 2019: The State of Free Speech on Our Nation’s Campuses analyzes the written policies at 466 of America’s top colleges and universities for their protection of free speech. The report finds that 89.7 percent of American colleges maintain policies that restrict — or too easily could restrict — student and faculty expression. All of the analyzed policies are accessible in FIRE’s Spotlight Database. FIRE rates schools as “red light,” “yellow light,” or “green light” based on how much, if any, speech protected by the First Amendment their policies restrict. More than a quarter of institutions in the report (28.5 percent) received FIRE’s poorest, red light rating for maintaining speech codes that both “clearly and substantially” restrict freedom of speech. Alarmingly, red light schools still make up at least half of FIRE-rated institutions in the District of Columbia and 11 states: Alaska, Delaware, Idaho, Illinois, Louisiana, Massachusetts, New Jersey, South Carolina, Vermont, Washington, and Wyoming. Only 9 percent of institutions (42 schools) do not maintain any policies that compromise student expression, earning FIRE’s highest, green light rating. This total is up from only 2 percent in 2009. Meanwhile, the number of institutions earning a yellow light rating is swelling: from 21 percent in 2009 to 61 percent today. While less restrictive than red light policies, yellow light policies still prohibit or have an impermissible chilling effect on constitutionally protected speech. Neither public nor private colleges have a monopoly on silencing students and faculty members. Just over 90 percent of public colleges maintain policies that don’t live up to their free speech obligations under the First Amendment. Private institutions are generally not bound by the First Amendment but are responsible for living up to their institutional commitments to free speech. More than 88 percent of private institutions fall short of those promises. Only 6 percent live up to their pledged speech protections, earning a green light rating. Another 6 percent earn a “warning” rating for promoting other principles, such as religious values, over free speech. Almost 800,000 college students attend an institution that maintains a “free speech zone” policy, through which student demonstrations and other expressive activities are quarantined to small or out-of-the-way areas of campus. Free speech zones have repeatedly been struck down by courts or voluntarily revised as part of lawsuit settlements. For the first time, the percentage of private universities earning FIRE’s worst, red light rating dropped below 50 percent, coming in at 47 percent. More than 50 administrations or faculty bodies have adopted statements in support of free speech modeled after the one adopted by the University of Chicago in January 2015. That’s up 15 from one year ago. Spotlight on Speech Codes 2019: The State of Free Speech on Our Nation’s Campuses can be read in full on FIRE’s website, along with previous speech code reports since 2006.